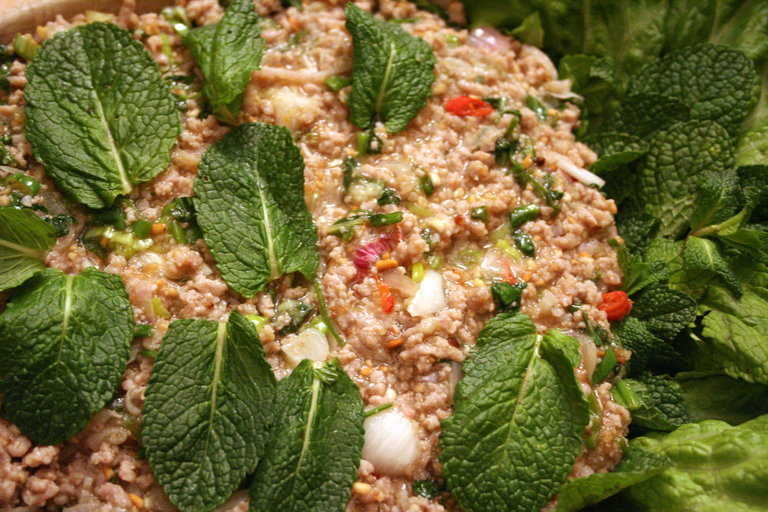 Laab, also known as Larb and Laap, is a northeastern food. It usually eaten as a part of a set (laab, papaya salad and sticky rice.) The set is accompanied by string beans, sliver of cabbage, water spinach and Thai basil. It can be served as an appetizer. It can also be served as a main course along with other non-northeastern food. There are variations of laab, duck laab, chicken laab. Squeeze juice from 1/3 of the lime on to the ground pork. Mix well and let it marinade for just a couple of minutes until you are ready to cook it. Heat up a pot on high until it is very hot. Add two tablespoons of water and then immediately add your marinated pork and stir. The pork will stick to the pan at first, but then the juice will come out and the meat will loosen from the bottom. Keep stirring until the pork is well done. Put the pork in a bowl a large mixing bowl that will hold all the ingredients. Add fish sauce, green onion, shallot, cilantro, the rest of the lime juice, chilli and almost all of toasted rice into the bowl. Save some toasted rice to sprinkle on top for garnish. Mix well and taste. It should be a little bit hot. You should be able to taste tartness from the lime juice and the fish sauce. If you need to add more fish sauce or lime juice, don't be afraid. Getting the flavour balance right is a trial and error process. Put the mixed ingredients in a serving bowl, garnish with spearmint and sprinkle the rest of toasted rice on top. Serve with vegetables like cabbage, green beans, lettuce and Thai basil.